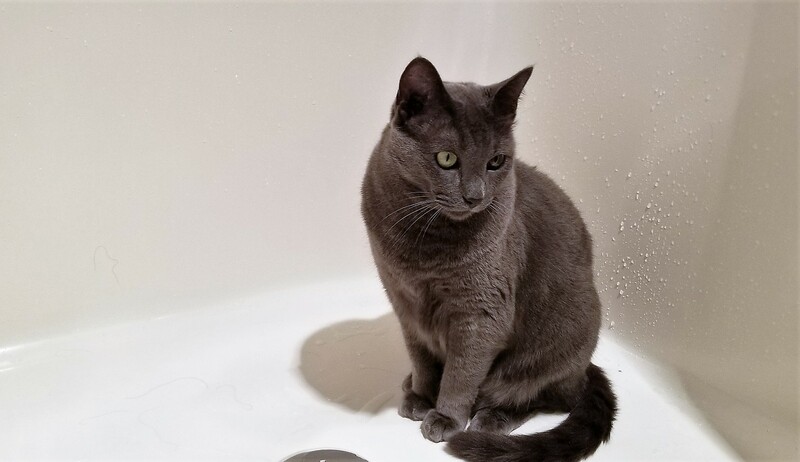 Exactly how many times are you going to take a photo of a cat in the shower? I feel ya. Have a grand week, Mary. Same to you, Cheryl! Hope to enjoy some sun today! Happy Monday, Mary. Hope you have a great week – in spite of the early chilly mornings. The mornings have been better as I am now parking in a garage (thanks to a neighbor) through the winter. The car has been warmer and there has been no scraping. Yay! Having your car parked indoors – winter or summer – is not a minor thing. Warmer in winter, cooler in summer, no scrapping, keeps the car clean from snow, ice, leaves, pollen etc. Right now I’m missing my indoor space. Son #2 has his car parked in my spot … long story. I’m hoping I get my spot back before the snows arrived. Brrrr. Aw, I love the morning routine, Mary. It’s almost like you were put here to please others 😉 Thanks for including No Facilities in that routine (sorry about the physics today). MuMu demands to be brushed at 5:05. I think she is working in concert with Gibbs. At least she cries in the distance, and isn’t smacking me in the face. PS, your hair looks great! Thank you so much for your sweet Monday comment…and you are welcome. No problem with the physics as long as you don’t start writing Einstein equations on your blog post. I’ll have a talk with Gibbs about this morning nonsense. As much good as it will do. Happy Monday, Dan! PS: I’m looking at my hair and laughing. It’s gonna need some work! I may be the odd one here, but I actually love Mondays because it gives me a sense of security that I have work. I mean waking up on Monday and doing no work actually makes me paranoid because then my mind fires all those financial security questions that I don’t want to answer. I can understand where you are coming from, Sharukh. There are times I take it for granted that I’ve had stable employment for so many years. Here’s wishing you much success and a Monday that is always filled with a work assignment. Hunting client work life is very different from a regular job life. Hence, my Monday perspective is a bit different. Thank you for your wishes. Oy…our cat Dessy woke us up at 3:15 am. She’s confused about time changes coming up – fall back not spring ahead…! Hope you have a great Monday! The hot shower is my favorite part…I could stay in there for a long time. Gibbs sends his love and says he’s ready for another stint in the shower stall. First of all, you’re really cute and it shouldn’t take you that long to be publicly cute, lol! Oh, you shower in the morning. Oh the shower. Well that just.. I can’t be bothered with cold and naked in the morning. Nope. Morning is cruel enough. Second, props to you on getting up with the birdies! Good mercy! I think anything before 7 is ungodly. I really do. If I’m up before 7 I feel rotten all day. Awww…thanks for telling me I’m cute, Joey. My hair has been a work in progress since I decided to grow it out. It’s been better of late, but I still have my bad hair days. I’ve been getting up with the birdies for many years so I can be at work by 6:45 am. The early wake-up only bothers me when I haven’t slept well or when it’s the middle of winter and -20 outside. Of course, that’s when the morning hot shower helps! I suppose I shouldn’t tell you I’m back to getting up about the same time on Saturday mornings to go work out with a trainer. I was awakened RUDELY at 5:49am and I thought of you, being already up and blow drying or whatever. Oof. It’s 5:15 and I can’t stop yawning. Not so much devoted as knowing that I need to keep at it with the weights. Taking the summer off was nice, but my back and shoulder muscles were not happy I was letting them go to crap. I like it that you get up so early so you can pay attention to the cats and take a break in the getting-up-and-going. Feels better than rushrushrush. I hate rushing in the morning, Marian. I simply can’t move that fast. The best mornings are on the weekends, when I an hang out in my pj’s, with coffee. Previous post Yeah, why would you?